Indigenous leader Valentina Boriskina fights coal mining that is devastating the lives of the Shor people in Siberia. From North Dakota to Siberia, indigenous communities are fighting dangerous fossil fuel projects that threaten their water and sacred sites. Valentina Boriskina is a member of the Shor people in Siberia. The Shor people’s ancestral lands are deep within the heart of Russia’s largest coal-mining region—the Kuzbass. Valentina is determined to keep her community in its ancestral lands. But in the Kuzbass the coal industry is trampling indigenous rights and environmental laws with impunity. Today, Valentina’s home, Chuvashki village, is the last of nine Shor settlements in the area. But staying is becoming ever more challenging. The village is surrounded by giant open pit coal mines. Every day, four or five explosions less than a mile away shake the village’s buildings and deposit toxic coal dust on the vegetables in people’s gardens. The water is dangerously polluted, but people have no choice but to drink it. Valentina’s home has turned into a wasteland. Sacred sites have been bulldozed, rivers emptied of fish, forests cut down, wildlife has vanished. Once a coal deposit has been exhausted, mining companies just move on to the next. “No one is restoring this land,” says Valentina. This devastation of their ancestral lands has robbed Valentina’s community of traditional lifeways and spiritual practices, and the toxic soil, water and air pollution is making her people sick and cutting their lives short. This short documentary, Condemned, shows how environmental destruction and intimidation by coal companies are forcing indigenous communities to leave their ancestral lands in the region of Kuzbass—one of the world’s largest coal mining areas. This past fall, Pacific Environment connected Valentina to the broader Russian and international movement against coal. 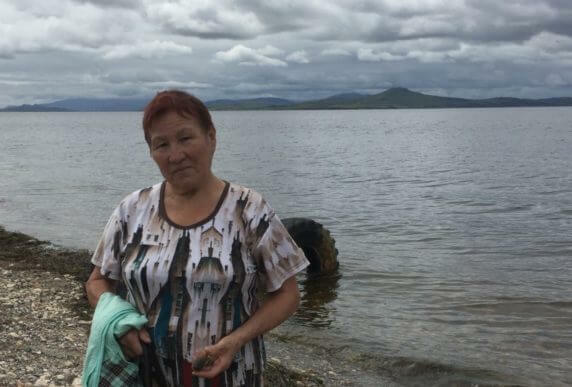 A three-day meeting in Vladivostok introduced her to other indigenous leaders, environmental campaigners, community activists, doctors and health scientists from Russia, China, the Philippines, United States and Europe. Here, Valentina realized that she and her village are not alone. There are many other communities around the Pacific Rim facing similar threats, and there are other leaders just like her who devote their lives to the fight against the dirtiest of fossil fuels: coal. The activists shared their experiences with the terrible harms caused by coal, which include premature deaths, asthma, heart attacks and more. Since these harms are largely unknown to the Russian public, activists believe that once people understand how much coal use harms human health, they will be able to build a broad, community-led movement against coal—similar to what happened in the United States. The global scope of the problem and the power of local community resistance really hit home with activists. In Vladivostok, where the meeting was held, people are gearing up to challenge planned export terminals that would ship coal to China and elsewhere. The news that community leaders in Oakland, California, had just succeeded in stopping a planned coal export terminal on the other side of the Pacific Ocean gave people hope that they, too, could succeed in challenging the harm coal is doing to their communities.